​​ BRYAN – Parc Communities LLC made its first foray outside of the Atlanta area, with Parc at Traditions—scheduled to open in fall 2017—will offer independent living, assisted-living and memory care services. 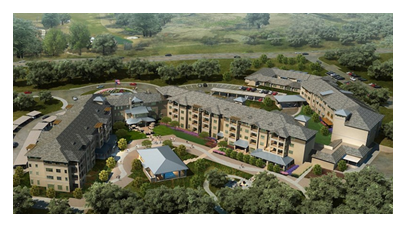 Located at 3095 Club Dr. on a 14-acre, wooded site, the community will feature 91 independent living, 44 assisted-living and 24 memory care units. The 159-unit luxury community in Bryan marks the company’s third owned and fifth developed community. Parc's neighbors include the newly-opened CHI St. Joseph MatureWell Lifestyle Center and Texas A&M Health Science Center.